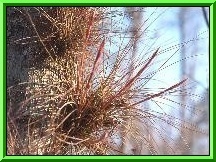 All of Florida's 16 native bromeliad species and two natural hybrids, are epiphytic. Natural hybrids are produced when cross-pollination occurs between species... producing a new offspring. Ten of Florida's 16 native bromeliad species are listed as either threatened or endangered. A threatened species is at risk of becoming an endangered species... and an endangered species is at risk of becoming extinct. Loss of habitat, illegal collecting of specimens from natural areas... and the non-native Mexican bromeliad weevil, Metamasius callizona, are the greatest threats to Florida's bromeliads. This section describes the distinct features of each of Florida's 16 native bromeliads and notes specific conservation concerns. 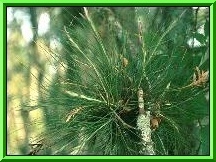 There are also two natural hybrids in Florida that are listed at the end. Please visit the additional information and references listed at the end of this section for any and all updates and credits. Description: tank epiphyte, may be terrestrial; bright green, flexible, leaves taper at the tip, about 1 in. wide, usually 10-12 in., may have white stripes; single floral spike to 16 in. ; many white flowers spirally arranged, 1 in. ; salmon colored apical floral bracts; cylindrical seed capsules 1 1/2 in. Description: tank epiphyte; 28 in. tall, single or in clusters; 15-30 leaves leathery, grey color due to scales (thichomes), may be reddish; leaves slightly bulbous at the base, tapering, curved or twisted at the ends; flower spike usually 2-10 lateral branches, scape 3-12 in. ; floral bracts bright red with violet petals, 5 flowers; seed capsules 1 3/4 in. Distribution in Florida: Alachua, Baker, Bradford, Citrus, Columbia, Dixie, Duval, Flagler, Franklin, Gilchrist, Gulf, Hernando, Highlands, Hillsborough, Indian River, Jefferson, Lafayette, Lake, Leon, Levy, Liberty, Manatee, Marion, Nassau, Orange, Osceola, Pasco, Polk, Putnam, Seminole, St. Johns, Sumter, Suwannee, Volusia, and Wakulla counties. Facts: leaves resemble those of a wetland rush; Bartman was an early Florida naturalist. 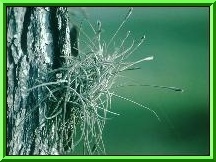 Description: epiphyte, grows to 12 in. long, plants densely clustered, grows in small tufts; leaves swollen at the base, curving tips, green to red; flower stalk 3-6 in., 3-15 violet flowers, 1 in. long; seed capsules 1 in. A. Tillandsia x floridana (Harry Luther). Natural hybrid of Tillandsia bartramii (Bartram's airplant) and Tillandsia fasciculata (Cardinal airplant). Tillandsia hystricina; Tillandsia fasciculata var. Thought to be only found in Florida. These plants usually grow in clusters. B. Tillandsia x smalliana (Harry Luther). Natural hybrid of Tillandsia balbisiana (Northern Needleleaf) and Tillandsia fasciculata (Cardinal airplant). Tillandsia x smalliana has been misdetermined as Tillandsia polystachia, a Caribbean species not found in Florida. Thought to be found only in Florida. These plants usually grows in clusters. Arny, Nancy P. 1996. 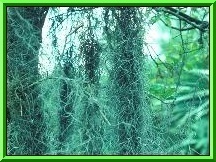 Spanish and Ball Moss. UF/IFAS FOR 52. Coile, Nancy C. Notes on Florida's Endangered and Threatened Plants. Bureau of Entomology, Nematology and Plant Pathology University of Florida, Botany Section Gainesville, FL. 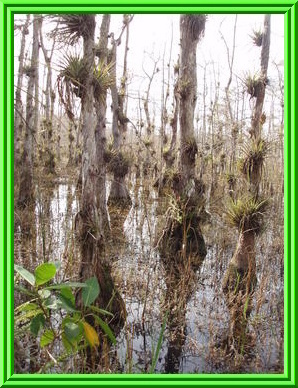 Florida Natural Areas Inventory. Matrix of Habitats and Distribution by County of Rare/Endangered species of Florida. Florida Natural Areas Inventory. Frank, J.H. 1996 Carnivorous bromeliads. Frank, J.H. 1996 Bromeliad Phytotelmata. Hall, David W. Illustrated Plants of Florida and the Costal Plain. Bureau of Nematology, FDACS/DPI, Gainesville, Florida. Larson, Barbra and J. Howard Frank. 2000. Mexican Bromeliad Weevil, Metemasius callizona (Chevrolat). UF/IFAS Featured Creatures. EENY-161. Long, Robert W. and Olga Lakela. A Flora of Tropical Florida. Banyan Books, Miami, FL. Save Florida's Native Bromeliads. A Project of the Florida Council of Bromeliad Societies and the University of Florida/IFAS. Sutton, David L. 1999. Aquatic, Wetland and Invasive Plant Glossary. University of Florida, Institute of Food and Agriculture Sciences, Gainesville, FL. Ward, Daniel B. (ed.). Plants Vol. 5, In: Rare and Endangered Biota of Florida. P.C.H. Pritchard (ed.). University Presses of Florida, Gainesville, 175 pp. 1. This document is Circular 1466 (UW205), one in a series of the Department of Wildlife Ecology & Conservation... Florida Cooperative Extension Service, Institute of Food and Agriculture Sciences (IFAS), University of Florida. Publication date: September 2004. Revised: October 2006. Florida A. & M. University Cooperative Extension Program, and Boards of County Commissioners Cooperating. Larry Arrington, Dean. This document is copyrighted by the University of Florida, Institute of Food and Agriculture Sciences (UF/IFAS) for the people of the State of Florida. UF/IFAS retains all rights under all conventions, but permits free reproduction by all agents and offices of the Cooperative Extension Service and the people of the State of Florida. Permission is granted to others to use these materials in part or in full for educational purposes, provided that full credit is given to the UF/IFAS, citing the publication, its source, and date of publication.